On August 1st, 2013, with this (somewhat embarrassing) post, Adam and I launched this blog. It is hard to believe that was almost three years ago. So much has changed in our lives since then. We've gotten married (#AVeryFlorkenWedding), we bought a house (#FlorkenFirstHome), and we have brought the most perfect little girl into the world (#LittleLadyHolland). We have also apparently overused personalized hashtags, but I digress. The blog itself has changed quite a bit. There used to be a new post five days a week. FIVE DAYS A WEEK! I remember feeling guilty if I took a day off and just had four for the week. Since Holland's birth, I have posted a grand total of sixteen times. That's it. And you know what? There has been no guilt. This blog used to be full of link-ups, sponsorships, sponsored posts, blogger features, and other paid or promotional content. I won't lie -- at one point I drank the Kool-Aid and thought that I too could become internet famous and rake in loads of extra cash every month just by showing up in this space and dazzling the world with my unique personality. That "reality" isn't a total lie. At the height of our blogging, we probably made an extra $200-$500 every month off blog income. It was nice. It also was not sustainable. The blog felt like a full-time gig, and I had a full-time gig being a lawyer. When I clocked out, I just wanted to enjoy time with my husband. The blog interfered with that desire. In November of 2014, I started to back off the strict "blogging schedule" I had imposed upon myself. I did however, still accept "sponsors" and still found myself constantly checking to see how many comments our posts received. Learning not to watch my page views and check my stats was a slow process. It honestly wasn't until I got pregnant with Holland, and found myself constantly sick, that I truly decided to give up the pipe dream of running the blog like a business. This blog is not a business. But it is a part of our lives. That last statement is even more true now that Holland is here. I have a constant craving to document our lives. Each day she gets older and I become even more aware that time passes almost too quickly to properly capture. But I want to capture it... 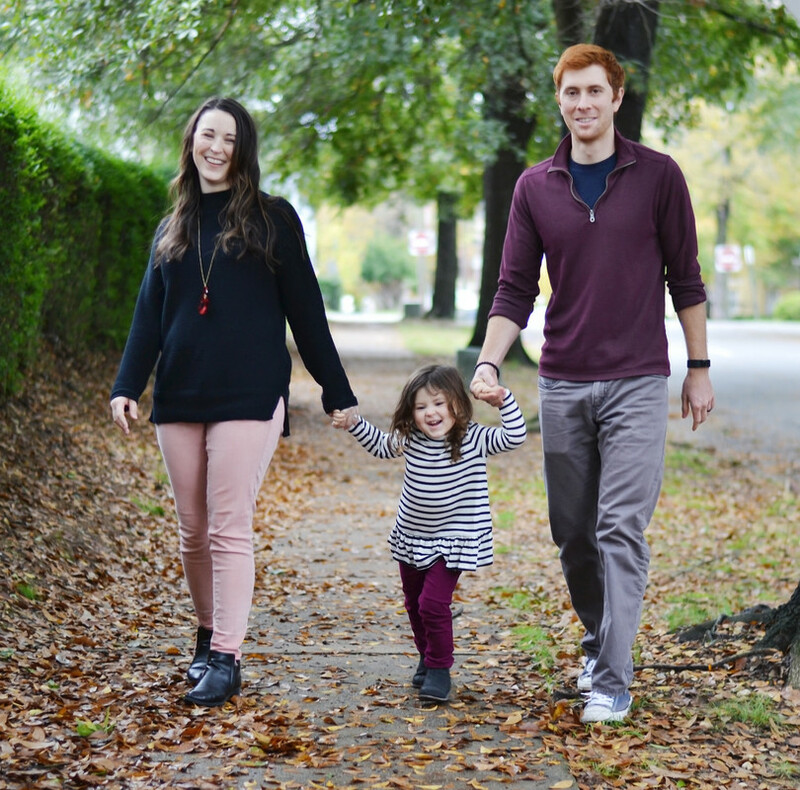 I want to remember what life was like for our little family of three. I also want to do more than just document our lives. Watching Holland grow has impressed upon me a real sense of duty. 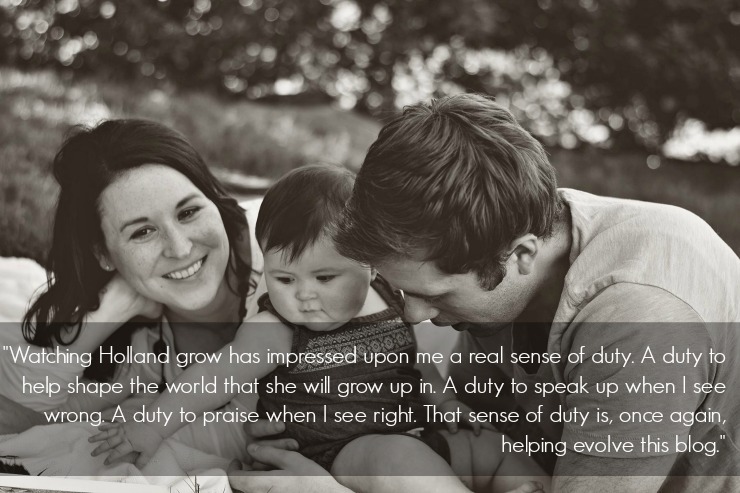 A duty to help shape the world that she will grow up in. A duty to speak up when I see wrong. A duty to praise when I see right. That sense of duty is helping evolve this blog once again. There was once a time where I steered clear of any political commentary or other controversial topic on this blog. I would think, "I cannot offend. I do not want to lose readers! I need their page views! I want them to like me!" That time has passed. It's true -- I do still want my readers to like me, but what is even more important to me is that my readers know the real me. The real me does not hesitate to talk to friends about controversial issues. The real me is passionate about politics. The real me does not want to sit idly by and not contribute to meaningful conversation in our world. There will still be posts here about parenting, home renovation and decorating, and other light-hearted topics. I'll document mundane trips to the farmer's market and share Holland's milestones. Heck, I might even still throw in a fashion post on occasion. However, there will also be posts here about politics and issues that I believe are shaping the world that my precious daughter will grow up to inherit. That means posts about climate change, gun control, and equality. It means posts about topics with no "easy answers" and posts that will likely offend some readers. I know that many long-time readers may be very disheartened by this evolved blog focus. There was once a time where blogs were my escape from those "heavy" topics so I understand the sentiment. It is however, more important for me to be a voice for bettering the world my daughter will grow up in than to rake in page views or decrease my bounce rate. If you decide to stick around, I'm thrilled to have you -- even if we do not always agree on those controversial topics. If you decide to unfollow, I will not take it personally. I do promise to be honest and as entertaining as I can in this space and more importantly, to ensure that this blog accurately reflects our little family of three and all the things we hold dear and believe. Change is not always comfortable, but it is often necessary. So let's do this. This makes me want to stick with your blog EVEN MORE. Documenting real life & not feel like you have to please to keep the traffic flowing, thats what makes the best blogs to me. I love real life. ^Ditto! I love that you don't want to shy away from discussing politics- Poli Sci nerd, here! And I love that all your posts are filled with actual substance- that's really hard to find in the blogging world! I am so happy and proud of you and this blog. It has been a joy to watch it evolve along with your life and I feel so connected to you as we have done so much on the same time line and share so many similarities. Keep on lady! Although we may not always agree on the above topics, I can't wait to see what you have to say about them & the conversations that will stem from the posts! Yes! I love reading blogs that are more real and about life and what you're doing and how you're feeling then the ones that are just trying to get sponsors and aren't "real". I like the real talk a lot better. Even if I don't agree with someone I would rather hear their thoughts. I love reading your posts but I understand that parenting is the most important job. Isn't it so odd how having a little one really changes your perspective. I love reading your posts and now I'm looking forward to them even more. I think your blog is so refreshing and real compared to most of the other ones out there that just push products. I think I'd read anything you posted! Happy Blogerversary and while I do miss you guys on the daily I totally feel you, especially that it is a full time job! When you have time to write, I will be here to read! I've been reading your blog for some time now, and am so looking forward to hearing what you have to say. My favorite blogs are the ones written by people who just want to tell their stories and express themselves on their own terms. Unfortunately, there are not nearly as many of those around as there used to be. Good to see that there's at least one more now! One of the few blogs I check anymore......can't wait to watch (what you share with us) Holland grow up.....in the "real world" Baby H, with you and Adam as parents, would make the best next door neighbors for our daughter, son in law and grand daughter - no judgement, only friendship and love ! JUST saw this.. Idk how I've missed it. It's likely because becoming a mom has deceased my blog activity and interaction, as well. But I LOVE IT. Go you!